Are Your Fish Receiving Enough Oxygen? Home > Blog > Fish Care > Are Your Fish Receiving Enough Oxygen? Sufficient oxygen is a necessity for pond fish. They will utilize the supplies which are present in the water, but it must be replaced over time. Waterfalls are a key component to this process because they make water move and slam against rocks, which in turn collects oxygen which produces water aeration. Aside from this, pond owners should also install either a pump or fountain to acquire additional aeration, since these features will boost the water area which is in direct contact with air. If you notice that your fish are frequently gasping near the surface for long periods of time, or the water becomes murky with an odor, these are signs that the fish are not receiving the oxygen they need. Fish may also attempt to leap from the pond. Any decomposing debris which is present will consume oxygen to varying degrees, and the more that is present, the more oxygen which will be consumed. This robs the fish of the aeration they need. Another thing which will consume oxygen at the expense of fish is algae, especially at night. 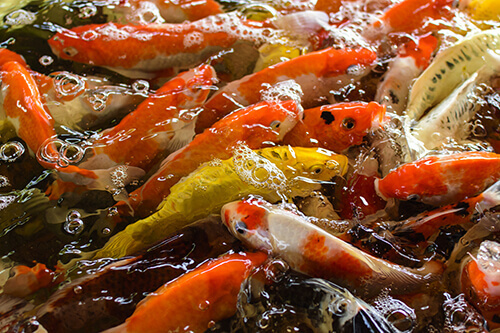 Many novice pond owners also make the mistake of adding too many fish to the pond, which places strain on the available supply of oxygen while maximizing the waste products which are deposited at the bottom. The key to providing fish with the essential oxygen they need is to eliminate debris from the bottom of the pond, evaluate the amount of fish present to ensure the pond is not overpopulated, and decrease the presence of fish if they are. Adding plants to the pond can also help in the oxygenation process. Aquatic plants which are submerged will assist in oxygen regulation by cooling down the surrounding environment. In fact, species that would under normal circumstances perish from direct sunlight or an arid climate will thrive if they are in the vicinity of waterfalls since these structures produce an evaporation rate which is high. The water will come into contact with rocks and pebbles and it will thin as it moves over them. The greater surface exposure which results will cause the water that is evaporated to exchange heat, which has been found to cool nearby air to between fifteen and twenty degrees. In other words, water which is evaporated will increase the protection of plants against sun rays. Aside from controlling your fish population and keeping the water clean, adding the right plants to the pond in key locations is one of the best ways to provide oxygen naturally. However, choosing the correct vegetation is essential as like fish they too can cause overpopulation once they mature. Two popular plants for this purpose are either Horse Tail or Papyrus. Both should be contained, preferably in a pocket which is separate or a planter which is constructed into the waterfall or pond itself.